This is a rez girl’s attempt at putting her words on “paper” whether its in cyberspace or in her cool red journal. This is a way of practicing and teaching myself to write on a regular basis. I daydream about writing but the only writing I really do these days are for academic or reporting purposes or else I am editing someone’s paper. I do enjoy reading other people’s writings but I really want to come up with a unique but easy-to-understand and interesting blog. I am not sure where this is directed but for now I am calling my blog “rezgurlstories” because that is essentially what I am at heart. I was raised by my parents and grandparents and entire family on the Navajo Nation (commonly referred to as the reservation or the rez) and it very different from growing up in an urban setting. 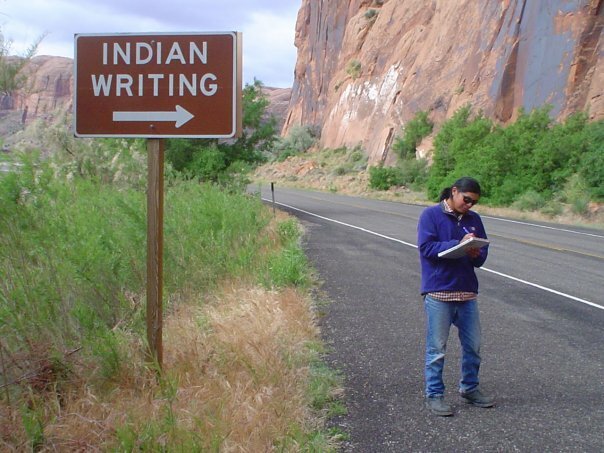 My Navajo culture carries a tradition of passing on stories, teaching and histories orally and hardly anything is written (of course that is changing quickly with technology) down for you to study and learn about your culture. You sat, sometimes for long periods of time, or walked with an elder and you listened and learned. Of course, I will carry on the oral tradition of our teachings but for the purposes of learning to write on a regular basis and honing my skills, I will be blogging (never thought I’d be saying that) about my life as it is. I was inspired by Tammy Strobel of Rowdykittens.com and her online writing course which has given me motivation and confidence to write as much as I can. My name is Nikki and I am a Diné woman from the Diné (Navajo) Nation in Arizona. I am of the Towering House Clan and born for the Reed People Clan. I am a parent to two wild and kind rugrats along with my partner and best friend. I live in a small town that people refer to as the “mountain town” of Arizona, but hope to relocate back to the Nation where we can be closer to my family especially my parents. Who exactly is a rez girl? Anyone who has lived or lives on or near a Native American reservation often refers to the reservation as the “rez.” For me, rez life entails a lot of traditional Navajo cultural activities and events. I speak fluent Navajo and know quite a bit about the culture, which is in large part due to my elders and parents and countless other folks, young and old, who have taught me a great deal of knowledge. I love to be out home on the rez because that is where I grew up and where I am physically and spiritually connected. That is also where a majority of family lives and I want to be close to my parents and grandparents. I cannot wait to move home! My other home is off the rez in Flagstaff, Arizona because my husband is a student and a nurse at the local hospital, and I have a full-time job at the university. For now, we have decided to live here in Flagstaff until we can find employment opportunities out on the rez for my husband and when we start building a physical home. I’ve lived here for about fifteen years on and off in between the rez and living out of state. So a rez girl, to me, is someone who has lived a majority of her life on the reservation or on tribal lands and knows that living there is a lot different then living in urban areas. I could give many examples but I’ll save those for later because the list is long. Perhaps I’ll poll my friends to give me their version of “you know you’re a rez girl if you…” and share it with everyone here on the blog. Life can be difficult in terms of not having access to a lot of things that are easily available in urban areas so you make due with what you have in front of you. You get resourceful, inventive and imaginative. All content including photos rights credited to Nikki Cooley and may not be reused without her permission.